It's not a bad idea to upgrade your OpenSSH (and derivative) services to OpenSSH 5.2. Red Hat Enterprise Linux ships with OpenSSH 4.x, but patches it in-house and releases these updates to RHEL users to fix certain bugs as they're fixed in the 5.x series. Sun Solaris 10 ships with "SunSSH 1.1" which is basically a mash-up based on OpenSSH 3.5p1. You see why I'm more than a little concerned, right? Without having the exploit code to test with, we don't know if the exploit will work against these bastardizations of the OpenSSH code-base. Without some solid proof, I'm not going to go to my boss and scream that the sky is falling. I just want to stay in touch with the OpenSSH / 0pwn0wn exploit drama. Google Alerts to the rescue! Google Alerts allows you to get rapid-fire email or RSS feed updates when new items show up in Google's index for given search terms. You can use this for vanity searching and a host of other things... or, as I do, to keep an eye on breaking news for more obscure stuff. With that, I set up alerts for OpenSSH (News and Blogs) and 0pen0wn (Comprehensive search) - If an exploit is released publicly, I want to know about it so that I can test it and make recommendations on how to fix it. 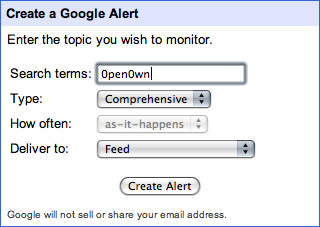 Also, it's not a bad idea to set up google alerts for other mission-critical products or services you rely on, if for nothing else, to keep your fingers on their pulse.